When you approach Meteora for the first time you can’t stop starring the beautiful scenery with awe. Gigantic rocks reaching heights of close to 2,000, which stand proud in the Plain of Thessaly. The most impressive fact though is the existence of monasteries on the top of the hills. Around the 16th century there were 24 functioning monasteries. Today only 6 exist and host monks and nuns. The whole scenery look so surreal and really worth a visit! Metéora is included on the UNESCO World Heritage List. If you just landed to Athens head to Larisa Station with the metro and take the train to Kalampaka. Kalampaka is just 5 minutes’ drive to Meteora. Another option is the public bus from Kifissos station (Athens) to Trikala and then another bus to Kalampaka. By car from Athens is about 4 hours’ drive. Set your GPS and hit the road Jack! If you want to wake up and enjoy your coffee with the view of Meteora right in front of you book a room at Kastraki village. Cute old houses from the 20th century mixed with new ones but on the same architecture. If you want a bigger city stay at Kalampaka. They are more facilities and shops and it is just 5 minutes’ drive from Kastraki and Meteora. The exact date of the establishment of the monasteries is not known. The first hermit monks moved up to the hills around the 9th century. The peak of the Byzantine monasteries existence was in the 16th century. At that time there were 24 monasteries. Today there are only 6 active monasteries. The Monastery of Great Meteoron, which is the biggest and most famous monastery, the Monastery of Varlaam, the Monastery of the Holy Trinity, the Monastery of St. Nicholas Anapausas, the Monastery of St. Stephen and the Monastery of Rousanou. The total number of nuns and monks that live in the monasteries today is about 66 today. Each monastery has specific visiting hours. Usually the opening hours are 09.00-15.00, but you have to check before your visit because there are differences. Keep in mind that the opening hours are different in summer and in winter. We suggest to go early (around 10 o’clock) to skip the potential crowds especially on weekend days. You should be dressed appropriately (modestly). Woman should wear long skirts. If you don’t have you can borrow one before your entrance. Greece is not only Acropolis and Santorini. 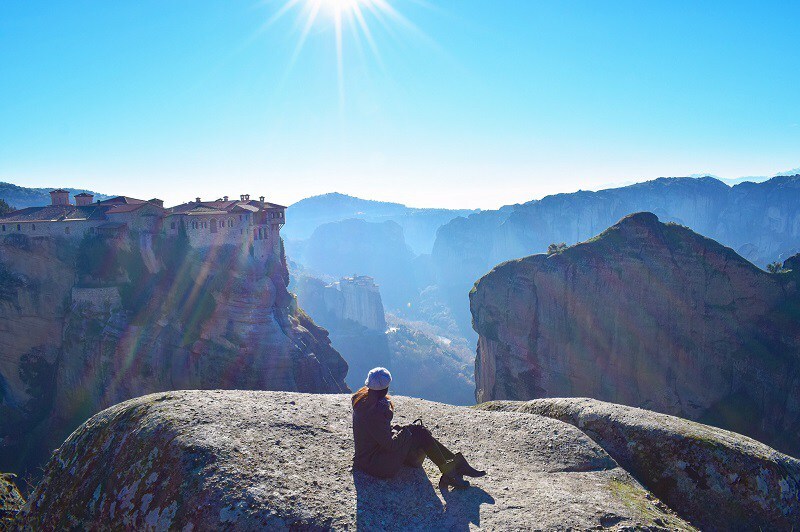 Meteora is one of the places you should really visit when you find yourself in Greece.